The result of the B-17 "All American" midair collision with a Messerschmitt Bf 109. “Comin’ in on a Wing and a Prayer” was a popular – sometimes all too real – saying in World War II. But this riveting phrase didn’t come from the 1944 motion picture Wing and a Prayer, which starred Don Ameche and Dana Andrews in the story of an aircraft carrier pilot in the Pacific. It was coined instead to describe the harrowing return flight of the "All American," a B-17 that had had its tail section all but torn off during a bombing mission over North Africa in early 1943. The All American was assigned to the 97th Bombardment Group, 414th Squadron, U.S. Eighth Air Force, based near Biskra, Algeria. Flying from a base near Biskra, an oasis city in the Sahara Desert in north-central Algeria, the 414th’s missions in early 1943 targeted Mediterranean seaports at Bizerte and Tunis, Tunisia. On February 1, 1943, the All American was part of a formation of bombers attacking the German-controlled seaport. Braving heavy flak and German fighters on the way in, the “All American” and her crew managed to drop their bombs and were on their way back to base. While returning home, enemy fighters pursued the bomber group to their maximum range. After the main attack had ended, two more Messerschmitts bf 109 fighters appeared and came in for the attack. The fighter passed over ‘All American,” to say with inches to spare would be inaccurate as the plane tore a significant hole in the rear of the fuselage and removed the left horizontal stabilizer. The remaining parts of the tail section, the vertical and right stabilizer seemed like they could shake loose at any moment. Miraculously, none of the B-17's crew were injured and the men all donned their parachutes, ready to abandon the plane should the tail break off. The other crews in the formation, seeing that the B-17 was crippled, but remaining aloft, slowed to a speed the injured bird could maintain and formed a formation around her until they were out from enemy territory. Once the formation was outside of the maximum range for the German fighter planes, the rest of the formation went on ahead and “All American” limped on alone. The Flying Fortress landed safely, though without her tail wheel. The B-17F was given a new tail and flew on mainly as a hack aircraft until March 1945. The 414th bomber squadron adopted a version of this image with a puppy praying atop the rear fuselage as a unit badge. 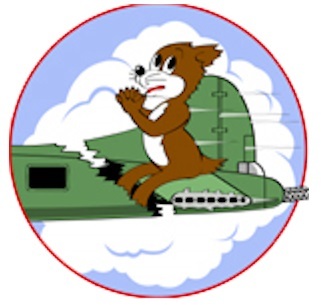 The 414th Bomber Squadron Emblem. 1. William N. Hess. Wings of Fame, Boeing B-17 Flying Fortress. London: Aerospace Publishing Ltd., 1997. 63.